With SharePoint Online, one of the Office 365 products, document libraries work the same way they do had you spent the time, energy, and resources of implementing SharePoint yourself. With SharePoint Online, however, you just sign up in the morning and begin using SharePoint in the afternoon. A document library is a special folder that you can access through your web browser or directly from within Office applications, such as Word or Excel. If you have ever used SharePoint, then you are familiar document libraries. A SharePoint document library takes care of the heavy lifting of managing content, such as the capability to check in and check out a document, versioning, security, and workflow. Each document in a library has a context menu that can be accessed by hovering over the item and then clicking the drop-down menu that appears in the right-hand corner. A familiar theme in Office 365 is integration between products. 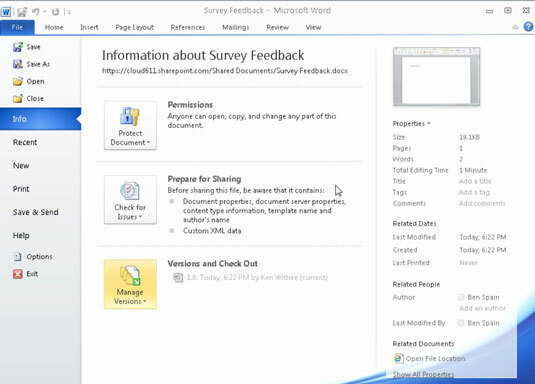 In addition to working with document library functionality, such as check in and check out by using the browser, you can also do so from within the Office documents. As you can imagine, it takes a lot of space in the database to store multiple versions of documents. For this reason, versioning is turned off by default on new SharePoint document libraries. On the Ribbon, click the Library tab and then click the Library Settings button. The Library Settings page appears. Click the Versioning Settings link. Select the versioning settings that are required for your scenario. You can choose to have No Versioning, Major Versions, or Major and Minor versions. Major versions are created when you check in a document and Minor versions are created when you save a draft. 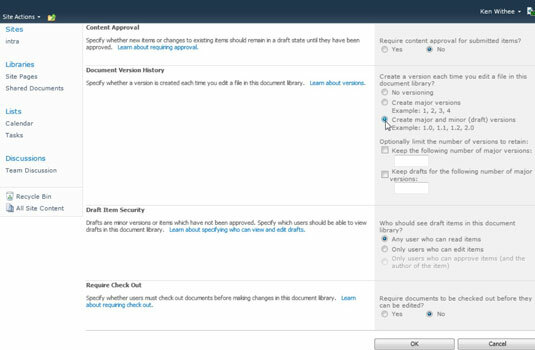 You can also configure a number of other settings, including requiring content approval, the number of versions to retain, the number of draft versions to retain, the level of security, and whether the library should require users to check out the document before they can make changes.